I once heard a rumor that almost provoked a deep moral crisis. I have always had a profound, passionate, and unshakable devotion to chocolate. Equally strong is my contempt for mosquitoes (and I’d say that even if I hadn’t contracted malaria during a summer in Indonesia when I was in college). The rumor, which turned out to be unsubstantiated, was that mosquitoes pollinate the cacao trees from which cocoa is produced. I had been worried, because I didn’t know how I could maintain my belief that mosquitoes were pure evil if they were necessary for the creation of pure good. Luckily, I did not have to grapple with this serious philosophical issue and I could go on loving chocolate and hating mosquitoes without feeling any inconsistency. The only real shortcoming of chocolate is that it has an unfortunate tendency to melt when you don’t want it to. Hot chocolate, hot fudge, and chocolate syrup are all fine if that’s what you’re expecting, but if you open a chocolate bar that’s been in a hot car, let’s say, and find that it has liquefied, you’re not going to get the experience you want. Then, of course, there’s the perennial problem of chocolate melting in your hands even when the ambient temperature is low enough to keep it solid. This is, so the ads would have us believe, the entire reason for the existence of M&Ms—a brilliant technological solution that doesn’t actually keep the chocolate from melting but at least keeps it from making a mess. A friend of mine who serves in the Swiss army told me that soldiers are supplied with a special chocolate bar that doesn’t melt, even in a pocket on a hot day—part of their standard rations. This sounded like a remarkable invention. I sampled some, and it was OK, though it had none of the soft creaminess for which Swiss chocolates are so famous. My friend considered it barely edible, but better than nothing (and much better than a pocket full of goo). 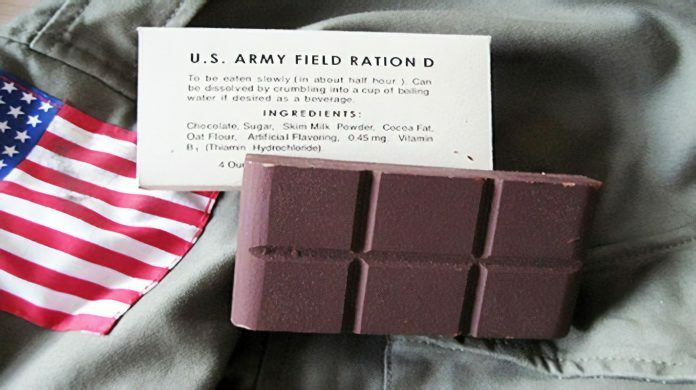 Members of the American military were issued nonmelting chocolate as early as the 1940s, when Hershey created its Field Ration “D,” but that bar, with its oat flour base, could hardly be considered a true chocolate bar. Chocolate technology has come a long way since then. In the first Gulf War, Hershey and Mars fought bitterly for a military contract to supply new and improved chocolate bars that would remain solid at temperatures up to 140°F (60°C). So how exactly does one go about making a chocolate bar that won’t melt? There are several techniques. Milk chocolate is generally composed of cocoa (or chocolate liquor), cocoa butter, milk, and sugar. It’s primarily the cocoa butter—a type of fat derived from cocoa beans—that determines the chocolate’s melting point. So one technique is simply to play with the proportions of ingredients, starting with a reduction in cocoa butter, until you get something that tastes reasonably good but still resists heat. You can also add solid fillers (as Hershey did originally) to soak up some of the fat, or use other stabilizing agents to keep the keep the bar rigid. (Hershey claims they added egg whites to milk chocolate for their more recent Desert Bar). But there’s a much simpler approach too. On a visit to a botanical garden in Costa Rica, we were given a sample of some homemade chocolate that, despite my best efforts, I couldn’t melt. Our guide told us that they harvested the cocoa beans by hand, roasted them, shelled them, and then ground the resulting cocoa nibs together with pure cane sugar (also produced locally). The mixture was pressed into molds and allowed to harden. This simple two-ingredient treat is a bit dry and grainy, but still delicious—and utterly heat-proof. Local markets sell the candy (with a variety of additional ingredients, such as nuts and ginger) alongside commercial chocolate bars. Additional undisclosed techniques have emerged in parts of the world where cocoa is produced in large quantities, such as Ghana. One would think there’d be a significant market for chocolate that won’t melt easily, especially in hot climates. But with few exceptions, heat-resistant chocolate has yet not become commercialized, and it’s extremely difficult for ordinary consumers to get their hands on it, at least in North America. Reportedly, major chocolate manufacturers such as Hershey, Mars, Nestlé, Cadbury, and Callebaut have created various approaches to manufacturing heat-resistant chocolates. Whether, when, or in what form the results will appear on store shelves remains to be seen. Let’s get going on this, guys. Global warming is only going to make matters worse. Note: This is an updated version of an article that originally appeared on Interesting Thing of the Day on July 26, 2003, and again in a slightly revised form on September 8, 2004.